​• Garden lovers will enjoy browsing through the garden which is enhanced by unique pieces of "garden art", including memories of times gone by & conveniently placed seats from which to contemplate the magnificent views. • Watch a Sunrise – for those who appreciate early mornings and know they are the best time of the day. • Fish from the jetty while your partner relaxes on an outdoor lounge chair under the willows. • Enjoy the flames from the luxury of your double (corner) spa (rainwater is plentiful). • If it's warm & relaxing or a good book is on your mind, you'll find the hammocks located under the blue gums. 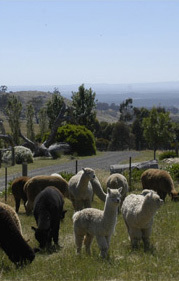 • Share some time with the alpacas – relax on a rug (provided) on a grassy slope, surrounded by these fascinating creatures. • Enjoy the flames from the luxury of your double spa - rainwater is plentiful. 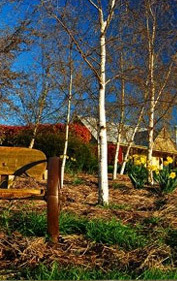 • In 20 minutes you will be in the heart of Castlemaine - Arts, Atmosphere, the Rest is History - the town is graced with stunning gardens, gracious buildings including Buda Historic Home, & a plethora of antique shops & old wares outlets - The Restorers Barn being particularly popular. 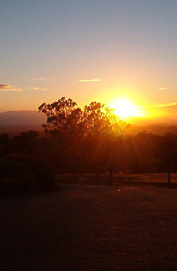 • The centre of Bendigo, just 25 minutes away, is home to: Bendigo Pottery; the Art Gallery; Central Deborah Gold Mine & much more. • Only 25 minutes drive through the wooded hills takes you to Maldon, declared Australia's "First Notable Town" in 1966 by the National trust - today it is a haven for visitors who are there to discover its diverse assets - cafes & restaurants, heritage buildings (take a guided historic tour), antique shops, galleries & specialty shops, not forgetting its Vintage Steam Train rides. NB. Book early to be a part of its annual Folk Festival.